Morgan Street Bridge and Corridor project ground breaking with dignitaries including the Governor of Illinois. When the City of Rockford was making plans to replace the aging Morgan Street Bridge, they envisioned the new bridge as a catalyst that would revitalize an isolated and impoverished area of town. Crawford, Murphy & Tilly (CMT) helped shape the vision by applying the principles of context-sensitive solutions to the complex bridge design using community focus groups that allowed stakeholders to conceptualize the revitalization plan. 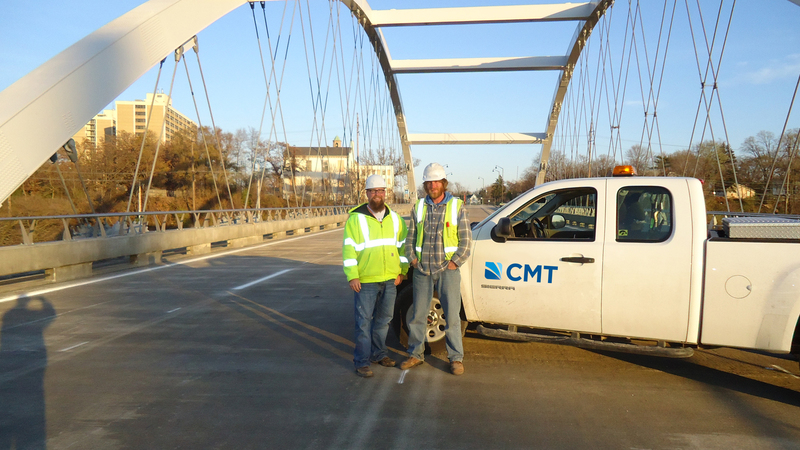 CMT provided planning, design and construction inspection services for a new, intricate, 503-foot, tied-arch bridge carrying Morgan Street over the Rock River south of the downtown area. 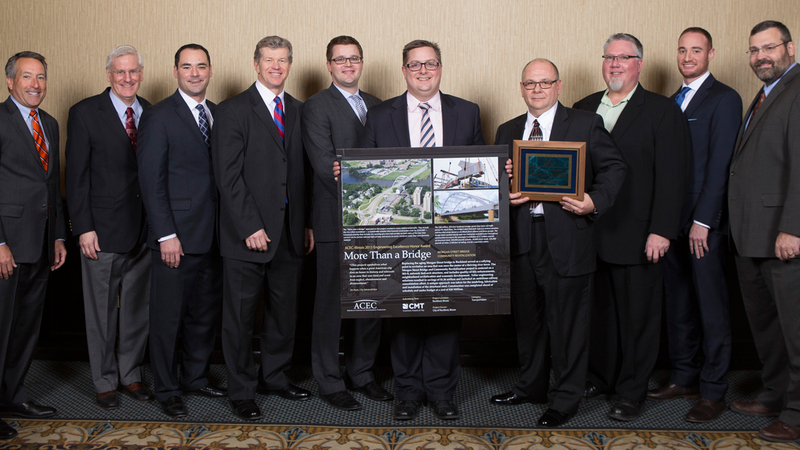 The $30 million structure includes two steel-plate, girder-supported spans, each approximately 116 feet in length. This landmark bridge that features many urban landscaping enhancements including period lighting, a bike path and pedestrian overlooks will serve to enhance the sense of community in the area. 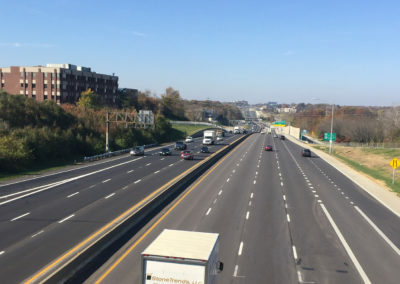 CMT led a Value Engineering (VE) study that generated numerous cost-savings proposals resulting in total savings of approximately $1.63 million. A significant outcome of the VE Study was the decision to permanently relocate and consolidate the Illinois Railway line underneath the bridge with the Chicago Central & Pacific line that runs through downtown Rockford. CMT led the project which involved total reconstruction and geometric alternatives for the realignment of approximately 0.7 miles of track with improvements to the existing diamond crossing interchanges, removal of four highway/grade crossings and an upgrade to five, new, at-grade crossings to high speed rail standards. Looks like all that planning and coordination during design is paying off. You [CMT] put in years of hard work that only insiders could see. Now you get the payoff. The city is changing for the better after many years of degradation. Thank you! Located within an environmentally sensitive area home to many industrial properties, CMT completed an extensive environmental site investigation report for the handling and mitigation of hazardous and special waste material within the project limits. As a result, the city has able to incorporate all environmental mitigation as part of the federal funding for the project. An initial sustainable solution was the reuse of the demolition material from the existing bridge and a nearby building as fill for the bridge embankment. Approximately 24,000 CY of recycled demolition material was incorporated into the design, yielding a project savings of $220,000. Several other abandoned buildings were demolished and use as land fill for the bridge project. Five buildings yielded a total of 16,000 CY of recycled material for an additional proposed savings of $250,000. An innovative, hybrid roundabout configuration included lower construction ($233,000) and life-cycle costs, the elimination of traffic signals and decrease in operations and maintenance costs. Documentation and compliance with regulatory bodies. Material QA, complex steel structure, weld and bolt connection, confined space, paint over waterway and cable strand tensioning inspection and documentation. Clean construction demolition debris inspection and documentation. Utility relocation coordination and de-energize of high-voltage power lines. Partnership with local law enforcement for joint use of construction time-lapse camera to monitor crime. Interviews with community leaders and other stakeholders to gain a perspective on current activities related to the area, individual visions of the future, expectations for this specific project, resources for implementation, and the likelihood of achievement. Identified alternative opportunities for rehabilitation of existing buildings and will identify probable redevelopment sites. 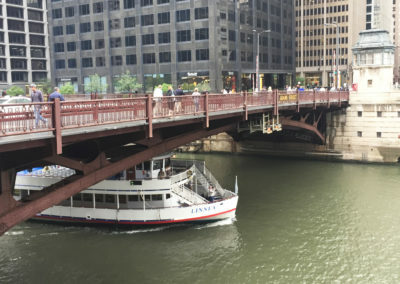 The VE study illustrated the benefits of using a single tied arch span that would eliminate piers in the river as well as provide a larger (and thus more dramatic) visual statement. This optimized configuration saved the city over $1.2 million. During the VE study it came to light that the re-routing of railroad traffic on the Illinois Railway track to a track operated by the Canadian National Railroad (CN) would greatly improve the safety of construction workers, eliminate adverse operational rail traffic impacts and eliminate the cost of a railroad flagger. This consolidation proposal would also eliminate five public at-grade crossings (south of the project) and the maintenance of a railroad bridge across the Rock River upstream from the Morgan Street Bridge. This consolidation recommendation saved the city $830,000. A roundabout intersection, instead of the conventional signalized intersection, costs less to construct, eliminates traffic signal operation and maintenance costs, reduces air pollution from stopped/idling vehicles and provides a center island for esthetic/landscaping purposes. 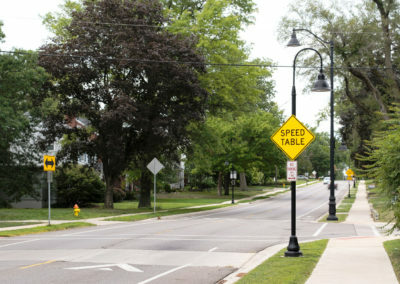 The roundabout intersection alternative saved the city $250,000.